Royal Cremation In Thailand To End Year Of Mourning For Beloved King : The Two-Way King Bhumibol Adulyadej, who was the world's longest-reigning living monarch when he died last year at the age of 88, will be cremated in an elaborate ceremony in Bangkok today. 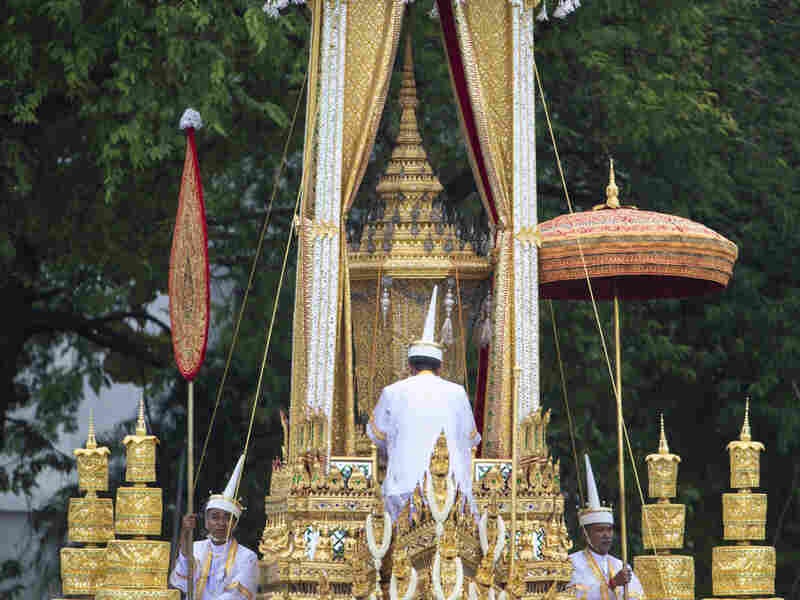 The ceremonial urn of Thailand's late King Bhumibol Adulyadej is transported during the funeral procession and royal cremation ceremony in Bangkok. Thailand's King Maha Vajiralongkorn takes part in the funeral of late Thai King Bhumibol Adulyadej in Bangkok, Thailand. Mourners hold aloft the portraits of late Thai King Bhumibol Adulyadej during his funeral procession and royal cremation ceremony. Soldiers pay their respects at the funeral procession and royal cremation ceremony of late Thai King Bhumibol Adulyadej. Japan's Prince Akishino and Princess Kiko are greeted by Thai Privy Councilor Charunthada Karnasuta as they arrive to attend the funeral procession and royal cremation ceremony of late Thai King Bhumibol Adulyadej. 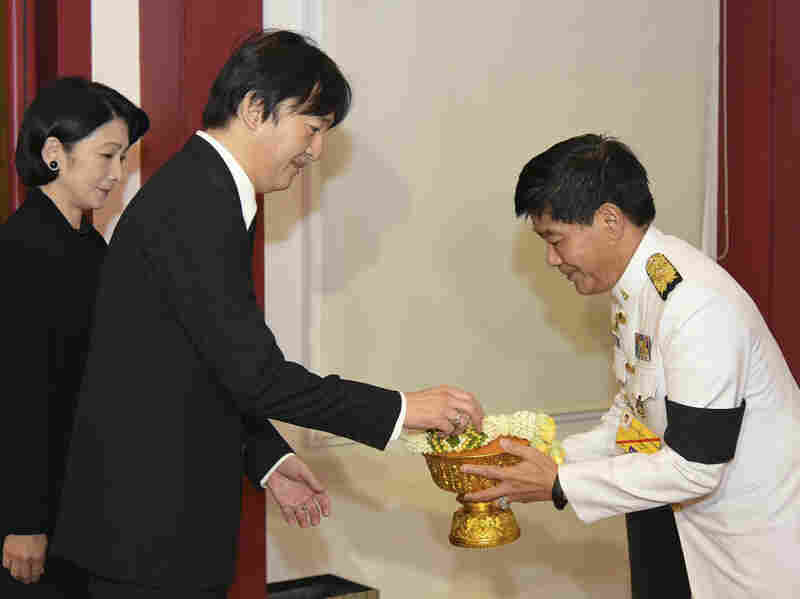 The image was provided by the Thai Foreign Ministry. Final preparations were underway in Thailand for the cremation of the revered late King Bhumibol Adulyadej, who died a year ago at the age of 88. Mourners, dressed in black, watched the elaborate sendoff for the man who was, at the time of his death, the world's longest-reigning monarch. As Michael Sullivan reports for NPR from Bangkok: "King Bhumipol Aduljadev was much revered by the Thai people — the only king most Thais knew until his death. 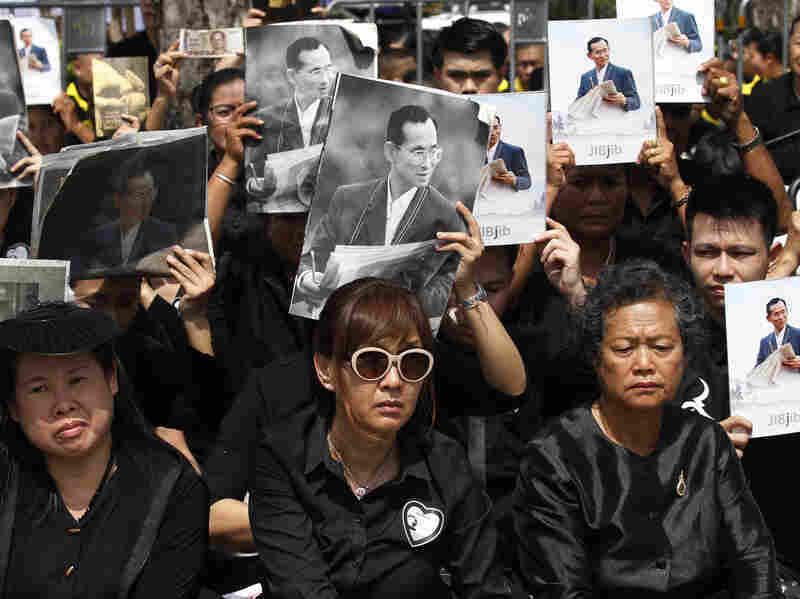 The funeral procession moved slowly from the Dusit Throne Hall to the cremation site, with tens of thousands lining the streets along the route." "Buildings along the parade route were draped in yellow marigolds, the color of the King. 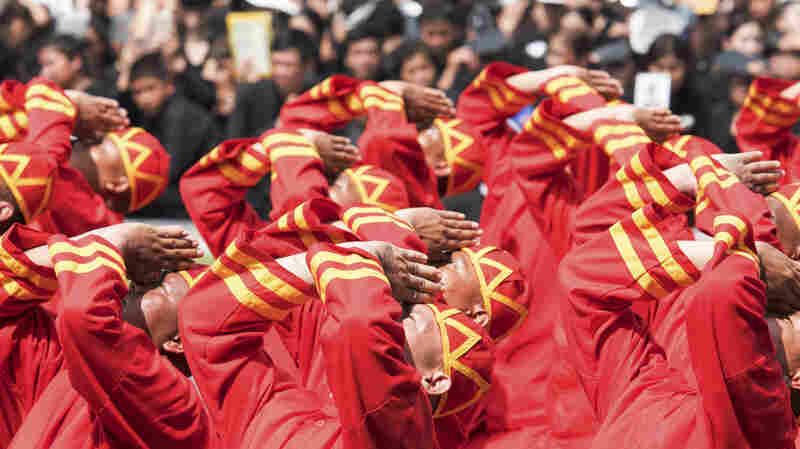 Many mourners slept overnight along the procession route and near the cremation site," Michael says. In preparation, the royal urn was "placed under a nine-tiered white umbrella and accompanied by a palace official, was then hoisted into the main chamber of the golden-spired crematorium as monks chanted, traditional instruments wailed and artillery fired in the distance. 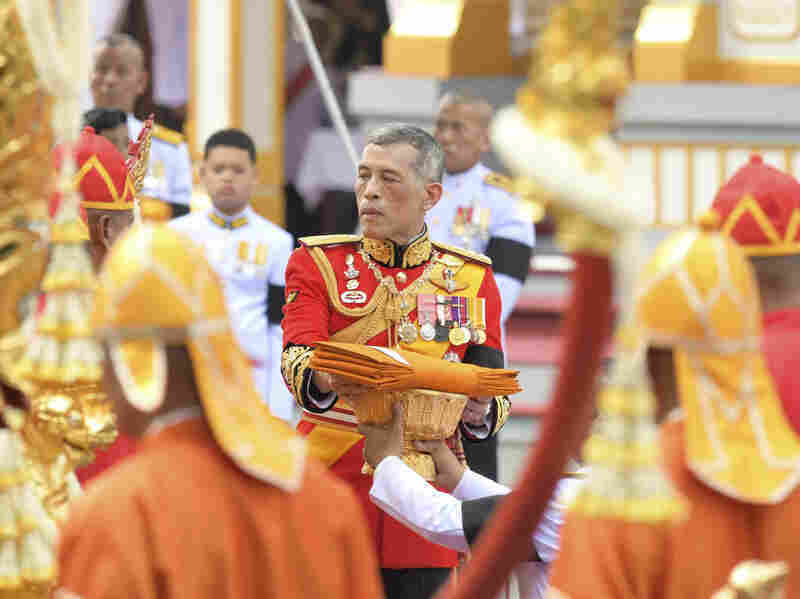 ... [King] Vajiralongkorn then climbed the red-carpeted steps to light candles and incense in honor of his father," according to The Associated Press. The New York Times reports that the 164-foot-high royal pyre and pavillion, which took 10 months to build, includes "statuary of the king's favorite pet dogs." The entire funeral ceremony cost $90 million, the newspaper says. As we reported on Wednesday, since Bhumibol's death on Oct. 13, 2016, "More than 12 million people have paid their respects at the throne hall of the royal Dusit palace in the capital, Bangkok, where the late king's remains have been housed for the past year. The ceremony concludes a year-long mourning period. The Bangkok Post quotes the government's royal organizing committee as saying that about 150,000 people had gathered at Sanam Luang and the Grand Palace for Thursday's procession of the urn. The actual cremation is scheduled for 10 p.m. Bangkok time (11 a.m. ET). The funeral pyre will be lit by Bhumibol's son, King Maha Vajiralongkorn.